Watlow® manufactures high-temperature tubular heaters to bridge the gap between standard tubular heaters and Watlow MULTICELL™ heaters. This tubular is well suited for process air heating applications in excess of 1300°F (704°C), resulting in a maximum sheath temperature of 1800°F (982°C). Controlled lab testing between the new design and current tubular designs shows an increase in life of approximately 50 percent. The high-temperature tubular consists of an engineered tubing with an alloy 600 outer sheath and a special internal construction. The outer sheath offers high temperature capabilities, reduced oxidation as well as corrosion resistance. 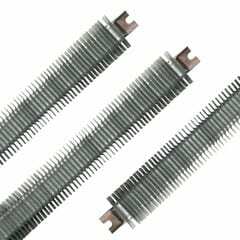 The tubular offering is available in 0.430 and 0.375 inch diameters that are configurable either as formed tubulars or process heaters. The heaters can also be welded to flanges and plates for mounting purposes. Maximum sheath length available is 275 inches for the 0.430 inch and 0.375 inch diameters. Contact a Watlow representative for longer sheath lengths. 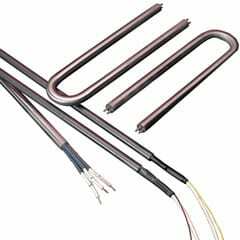 The tubular element with multiple coils and/or thermocouples inside one sheath from Watlow® answers the need for a versatile, innovative tubular heater. Watlow’s patented method of packaging a thermocouple inside of a heater with one or more resistance coils, gives the ability to sense a heaters’ internal temperature accurately, every time. Our milled groove heaters are precision-formed and customized to your hot runner mold application. 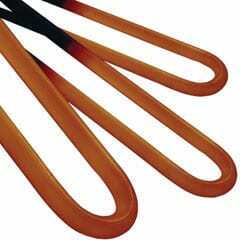 Even tight radius bends of 0.250 inch maintaining tolerances of ±0.062 to ±0.002 inch are possible. This capability not only allows you freedom to design for the optimum uniform heating pattern for your plastics process, but also guarantees quick and easy installation. Simply send us your groove dimensions in a detailed drawing or on CAD disc. 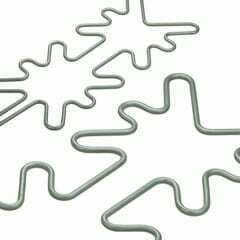 Depending on your heater formation requirements, our resulting CAD design will be transferred to either our CNC bending equipment or one of our highly skilled bending operators. A variety of sheath materials are available including Incoloy®, 304 stainless steel and 316 stainless steel; each offering unique advantages of long life in high temperature molds, rigidity to maintain shape during shipment, and corrosion resistance. Star Electric not only delivers the heat fast to your process with efficient heat transfer, but guarantees the heater’s fast delivery. 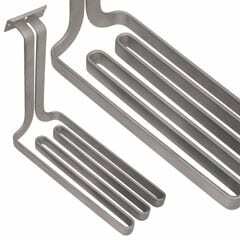 For over half a century, people have been using round tubular heating elements for surface heating. The Watlow® FIREBAR® flat tubular heater is an innovative concept that provides a wide array of design improvements. In oil and other viscous materials, a FIREBAR flat tubular heater operates at a higher watt density than a round tubular heating element without changing the sheath temperature. The FIREBAR heater also enables you to place more wattage into applications at the same watt density without using a longer heating element. Due to its unique design and geometry, a FIREBAR heater often heats fluids from ambient temperatures faster than round tubular elements, while using the same wattage and lower sheath temperatures. Flat tubular heater performance in cooking oil instead of a round tubular makes it a perfect choice to combine with Watlow temperature and power controllers for the best solution for energy efficiency. The FIREBAR has been tested in equipment to ASTM F1361. This is the standard test method for the performance of open deep fat fryers. When direct immersion in liquid is not practical, FIREBAR elements may be clamped to tank walls. FIREBAR’s large flat surface area enables it to efficiently transfer heat to the tank walls and into the media. The larger contact area afforded by the FIREBAR design enables the heater to operate at lower coil and sheath temperatures and allows for longer heater life. Reducing watt density or sheath temperature extends the life of any heater. The FIREBAR heater allows you to do either without changing equipment performance. Heat transfer, lower sheath temperature and element life are all maximized by the FINBAR heater’s finned construction. Installation is simplified by terminations exiting at one end and mounting accommodations on both ends.